As the Final Design Phase nears completion, the Niagara Street Now team invites you to an “Open House” to preview the final plans and to receive an update on project costs and schedule. This will be the last meeting before the project moves forward into the Construction Phase. The City of Buffalo’s Department of Public Works and the Buffalo Sewer Authority are leading an effort to transform Niagara Street. This streetscape project seeks to enhance accessibility, safety, and corridor vibrancy for all – residents, visitors, and businesses. The first step is currently under construction and involves work on the lower part of Niagara Street, from Niagara Square to Porter. Niagara Street Now represents the next step of this effort and will tackle the remaining stretch of Niagara Street, from Porter Avenue up to Ontario Street. Further, it will involve upgrades to Robert Rich Way (formerly known as the “Foot of Ferry”) in accordance with the Broderick Park Master Plan, and make enhancements to the Shoreline Trail from Broderick Park to the International Railroad Bridge. Over a four-month period, more than 600 residents, business owners, and stakeholders shaped a set of priorities for the future of Niagara Street. Summarized in the community vision document, these priorities will guide the streetscape re-design of Niagara Street, from Porter to Ontario. As a product of the community, neighborhood groups, organizations, and others are welcome to use the report and its finding as they pursue projects, initiatives, or planning efforts to advance community goals for the corridor and nearby neighborhoods. Learn more about the effort, the work that will be done and ways you can get involved. 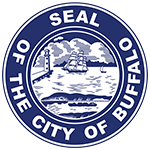 The City of Buffalo's Department of Public Works and the Buffalo Sewer Authority are leading an effort to transform Niagara Street.